The SharkSafe barrier exploits the sensitivity of the electro‐receptors in sharks by over‐stimulating their sensory systems, while not affecting bony shes and other marine life. To enhance the effectiveness of the shark barrier, magnets are arranged along the length of each member. It has been shown that magnets deter a number of shark species, including great white sharks, bull sharks, tiger sharks, hammerhead sharks, and rays. Plastic tubes containing high density foam may be used as barrier members in order to provide oatation. The innovation thus provides an environmentally friendly and cost-effective alternative to conventional anti-shark devices such as shark nets, drum lines and exclusion nets. Municipalities, local government, marine environmentalists and conservationalists. Members are capable of resisting oceanic tidal currents. The barrier can be used to protect relatively large areas. Environmentally friendly: use of the barrier is not detrimental to sharks or other aquatic creatures. Materials used allow for algae growth. 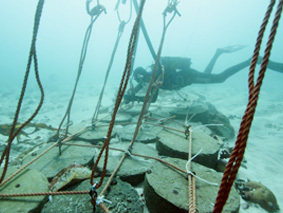 The combination of a thicket-like appearance and the magnetic effect provided by the shark barrier enhances the effectiveness of the barrier. Articulated member con gurations allow slight movement as a result of oceanic currents, without causing an entire member to shift horizontally. No risk of animal entanglement exists. The innovation proposes a shark barrier comprising multiple, preferably interconnected, elongate members extending from the sea oor to the sea surface. The magnets provided on the members exploit the sensitivity of the Ampullae of Lorenzini in sharks by over-stimulating their electro-sensory systems, while not affecting bony shes. A PCT/IB2013/060446 application has been led, as well as a South African patent application. Prof. Conrad Matthee, principle researcher at the Evolutionary Genomics Group at Stellenbosch University (SU). Sara Andreotti, PhD candidate at the Evolutionary Genomics Group at SU. Craig Patrick O’Connell, PhD candidate at the University of massachusetts, Dartmouth. Michael Rutzen, expert shark cage diving operator.